Weekly rehearsals for the Blue Mountain Chorus are loaded with learning, laughing, and creating the great sounds of harmony! Interested female vocalists are welcome to visit any Monday evening at 6:30 pm! Any age group – any ability level! Bring family, friends, co-workers! Guests and prospective members are always welcome! 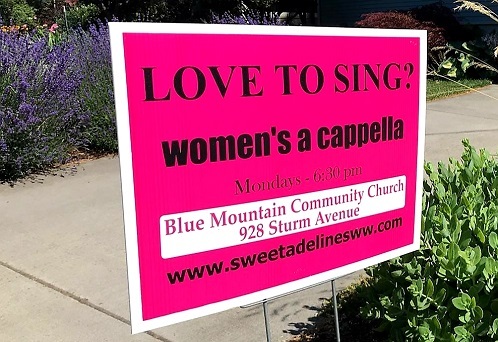 For more information about singing with Blue Mountain Chorus, call or text 509-795-0990. Mailing address: Blue Mountain Chorus Sweet Adelines, P.O. Box 358, Walla Walla, 99362.